Green Skill Development Programme on “Laboratory Assistant for Eco-Friendly Food Testing Laboratory” at ENVIS-NIOH Resources Partner, ICMR-NIOH, Ahmedabad has been started on 23rd July, 2018. The Inaugural function was started with Prayer by Dr. Mamta Purohit and Lighting of Lamp by Dr. Chander Shekhar, Additional Director General, ICMR New Delhi. Welcome Address was given by Dr. H. G. Sadhu, Scientist-F, ICMR-NIOH. He gave brief introduction of chief guest Dr. Chander Shekhar and acknowledged MoEF&CC. Introduction about the course was given briefly by Dr. L. K. Sharma, Scientist-C, Envis Co-coordinator. The Presidential Address was given by Dr. Kamalesh Sarkar, Director, ICMR-NIOH. He explained the importance of Green skill Development Programme to fill demand-supply gaps of skill sets at various levels. Explaining the role and contribution of ICMR-NIOH to improve the health and well being of workers, he also introduce participants about ENVIS-NIOH and its activities and how it is engaged in collection, collation, storage, retrieval and dissemination of Indian information related to Occupational and environmental health. Inaugural Address was delivered by the chief guest Dr. Chander Shekhar, Additional Director General, ICMR New Delhi. Head, Innovation & Translational Research, Intellectual Property Rights, ICMR New Delhi. Dr. Shekhar introduced ICMR and its activities for the betterment of the society. He stated that how MoEF&CC, under GSDP, is working for the dream of our honourable PM, to make India the skill capital of the World. 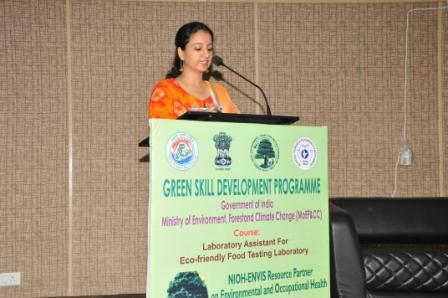 Vote of thanks was proposed by Dr. Rekha Kashyap, Scientist-F and ENVIS Coordinator. As a part of lecture series, introductory lecture about NIOH & NIOH-ENVIS to the GSDP Participant was given by Dr. L. K. Sharma and introduction of the course was given by Dr. Mamta Purohit, Programme Officer, NIOH-ENVIS.